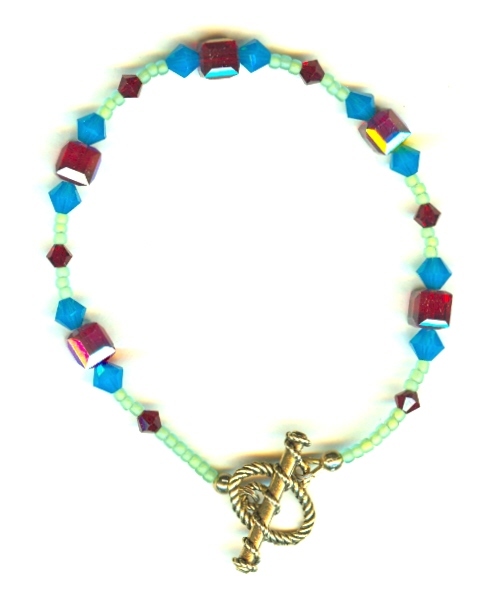 Swarovski Crystal?s Siam ruby red and Caribbean blue opal beads team up with exotic results in this charming and lightweight bracelet. The larger beads are spaced with matte spring green seed beads, and the 7-5/8 inch beauty closes with an old gold tone toggle clasp. A night in the Caribbean wearing this bracelet: what could be better? Not just your average jewelry set, this bracelet and earrings features brilliantly colored vintage and contemporary Swarovski crystal beads. The beautiful clear lucite pendant drops over 4" below the strand!